There’s Still Time to Place your order at Bristol Farms! I’m a big fan of Bristol Farms, a SoCal grocery store chain that sells quality food items and other fabulous products. I’ve partnered with them on several occasions and they’ve supported my Mommy In Los Angeles Magazine venture. This year for Valentine’s Day, Bristol Farms revealed a special dinner meal for two—a lovely offering that includes HEART-shaped wellingtons with Potato Au Gratin Dauphinoise, Steamed Asparagus & Peppers and Heart-Shaped Chocolate Ganache. I figured picking up the Bristol Farms Valentine’s Meal for Two would be an excellent way of spending a quiet evening with Paul, in anticipation of Lovers Day, and without the hassle of having to cook, bake, and deal with the aftermath of a messy kitchen. For a romantic dinner, it’s all in the details, friends! Besides picking up the Valentines Day Dinner for Two, I shopped at Bristol Farms for flowers, a good bottle of bubbly, and even found the gorgeous gold bucket container where I placed the bottle! And get this, the crisp Riedel glasses you see as part of my table set-up can also be purchased at Bristol Farms (I got mine at the Pasadena store)! Filet of Beef – with pâté inside a puff pastry heart with a side of burgundy mushroom sauce. Salmon – with sautéed spinach inside a puff pastry heart with a side of béchamel sauce. Chicken – with mushrooms and brie inside a puff pastry hearth with a side of burgundy mushroom sauce. Vegetarian Lasagna – Grilled vegetables, cheeses, pasta marinara all layered inside a puff pastry heart. you can place a few candles on the table, a small frame with a picture of you and bae and let the pink Lillies make the biggest statement just by sitting pretty. Friends, we had the Chicken Wellington option for dinner and it was a great. Paul usually doesn’t like taking pictures at the dinner table. But he agreed to a selfie before receiving his Valentine’s Day card, which by the way, I also found at Bristol Farms in Woodland Hills. for always agreeing to participate in my blogger and magazine journeys and making every special occasion more meaningful. I love you, hot stuff! While I was preparing the dinner table, he would come by and say things like— when can we eat? LOL. But then he’d offer to help and tell me I looked cute! (the bottle costs $12.99) Then we lounged afterwards and watched funny YouTube videos. The kids were at grandma’s house after having enjoyed a surprise dessert table earlier in the day. Gone are the years we would make reservations in advance at fancy restaurants for special V-Day pre-fix meals. These days, having a quiet night at home with a glass of wine, after a good meal is all I want, kinda’. Ok, fine— I still love fancy restaurants! But this year, a fancy dining table set-up and a delicious dinner at home (and at a fraction of the cost) was perfection. And thanks for reading friends! To order your Valentine’s Day Dinner Meal for two before midnight tonight (2/12/19), click here. Friends, my husband Paul is finally leaving his law enforcement career for a job as a mental health professional! Back in 2017, he graduated with a Masters in Marital and Family Therapy (MFT) but remained in his job as a peace officer waiting for the perfect opportunity to leave. It looks like the new year brought him good luck because that perfect opportunity arrived last week when he was hired to join the team at a public agency where he will offer therapy to at-risk youth! with dozens of locations in California alone. Chances are you’ve been to an Olive Garden before and indulged in their warm bread sticks and yummy pastas. But did you know Olive Garden also offers a really good “Tastes of the Mediterranean” menu? Olive Garden has an extensive wine list. I recommend pairing the Picatta dishes with a glass of Settesoli Seven Suns Chardonnay. 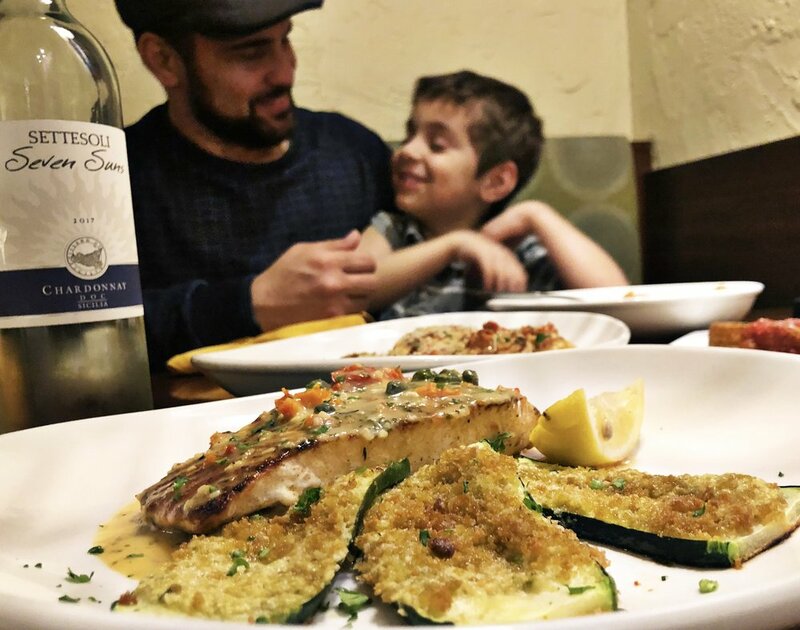 the menu highlights familiar cooking styles from the region featuring fresh, robust ingredients like seafood, veggies and olive oil. Best of all, each item from Olive Garden’s Tastes of the Mediterranean menu is under 600 calories! Eating lighter doesn’t mean we have to sacrifice flavor, friends! 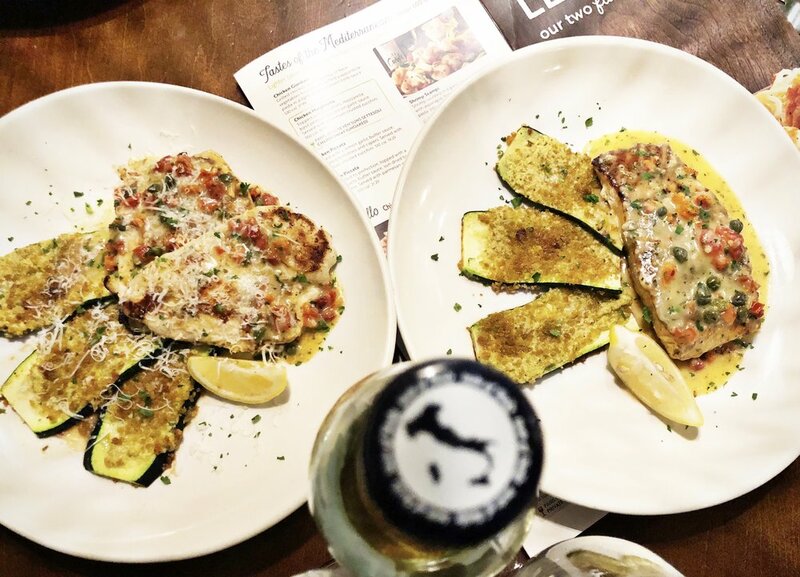 He ordered Chicken Picatta and I went for the Salmon Picatta, a grilled salmon dish topped with a lemon garlic butter sauce, sun-dried tomatoes and capers. By the way, capers are the pickled flower buds of a plant called Capparis spinose. They’re used in many Mediterranean dishes and pair perfectly with the lemon garlic butter sauce on this particular dish. “When it comes down to the acidity, the capers help balance it out,” explained the restaurant’s chef. For the boys we ordered Spaghetti. Because what child doesn’t love slurping noodles with marinara sauce!? Benny and Toby behaved pretty well throughout the evening. That’s not to ignore the fact that they spilled a cup of water over the table set-up and ended up wrestling for crayons underneath the booth. Still, the pre-mealtime chaos was paused when little Toby saw his fresh bowl of spaghetti (which comes with an order of chicken fingers) delivered right before his eyes. 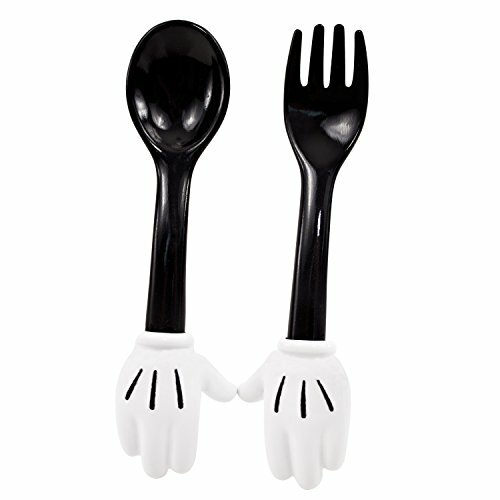 Ahhh, to feel a child’s culinary excitement! we couldn’t possibly leave Olive Garden without a celebratory dessert! We ordered a slice of chocolate cake and some incredibly delicious Zeppoli (think rectangle-shaped beignets with chocolate dipping sauce). The restaurant manager, Mr. Steven Crum, stopped by our table to greet us. His visit was reminiscent of a dining experience at a quaint family restaurant, where the owner gets to know his patrons. Mr. Crum has been managing Olive Garden restaurants in the San Fernando Valley & Burbank areas for over 25 years! Thanks for a great experience, Steven! You’ve worked hard for a new career and brought us along for the rollercoaster ride. I couldn’t be prouder of your determination. Love you, Paul! Thanks Olive Garden, the Tastes of the Mediterranean menu is light and delicious. Looking forward to another visit! Next time, I want to try the Shrimp Scampi or maybe the Chicken Margherita…or the Chicken Giardino…you get the point…yummmm! Celebrate "Dia De Los Reyes" with Mexican-Style Pizza & Lemon Pie! A Great Way to Enjoy our Mexican Traditions with DiGiorno & Nestlé Products from Walmart! Growing up in a Mexican home, the holidays always meant A LOT of celebrations. And each one was always complemented by a traditional meal and a yummy dessert like a Lemon Layered Cookie Pie made with Mexican Maria Cookies, fresh lemon juice and two types of Nestle Nestlé products. 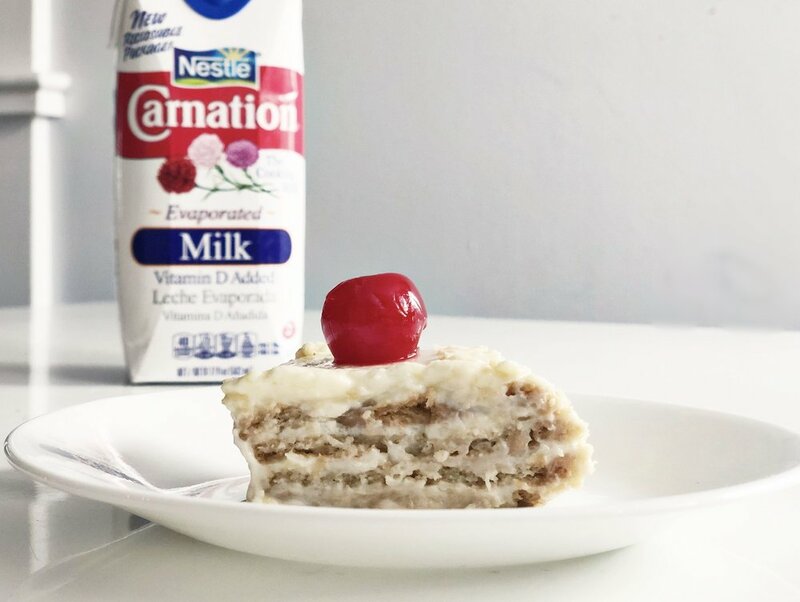 I don’t know why, but for me, Carnation Evaporated Milk always evokes special thoughts and memories of family togetherness and holiday harmony. Before getting into the desserts though, let me offer a bit of background regarding my family’s year-end celebrations. I’m a December baby and so is my son, Benny. This means we plan a couple of birthday celebrations annually to kick off the last month of the year! Then on December 24, we gather for Nochebuena, where the family celebrates Christmas Eve with a traditional Posada, which is sort of like a reenactment of when Jesus was born and Mary and Joseph went around town asking for shelter. In the Mexican tradition, this activity includes music, prayer and plenty of food afterwards. we’re usually home opening gifts and enjoying leftover tamales from the night before. We enjoy Christmas cookies or a Christmas cake to celebrate the occasion. On December 31st we celebrate the new year, of course! Then on January 6, it’s Dia de los Reyes Magos or “The Three Kings Day” where we hang out with family for an evening of small bites and dessert (more on the dessert in a bit). For Three Kings Day, families in the U.S. usually take a break and prepare a much simpler meal. One good option is to head to Walmart and purchase a frozen DIGIORNO® pizza plus a few ingredients to make a tasty dessert. 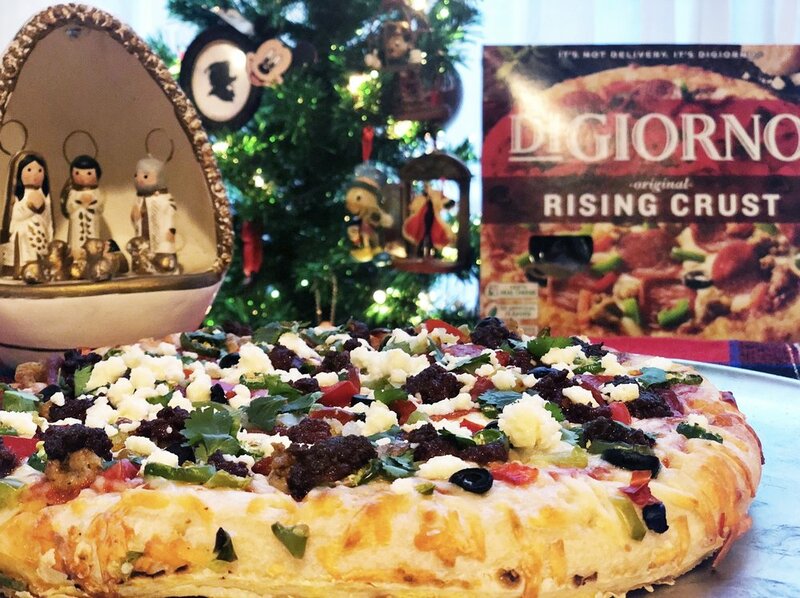 The DiGiorno Rising Crust pizza comes loaded with great toppings and offers an amazing fresh baked taste, straight from the oven. And if you want to make the occasion extra memorable, you can add a few ingredients to make it a pizza with Mexican flair! Did you know DiGiorno Rising Crust Pizza has no preservatives in crust, no artificial flavors and it’s made with 100% real cheese? It’s sooooo good! I added beef chorizo, green chilli peppers, Mexican ranchero cheese and cilantro to give it a unique and spicy taste. It’s a perfect dish to entertain guests on Dia De los Reyes. children wait for the Three Kings to deliver toys and gifts on January 6, the same way we wait for Santa Claus on the 25th of December. There is a traditional sweet bread ring called Rosca de Reyes which is served that day. The person who cuts a slice of rosca that contains a plastic baby figurine has to throw a party on February 2nd (I think I’ll encourage people to consider a Pizza party this year!!). What’s pizza without a good dessert!? I’m sharing a yummy and super easy recipe that many Mexican households enjoy during the holidays. It’s a Lemon Layered Cookie Dessert that only requires four ingredients! It’s a smooth and creamy treat that has the texture of thick pudding with cookie crumble and a delicious lemon flavor. 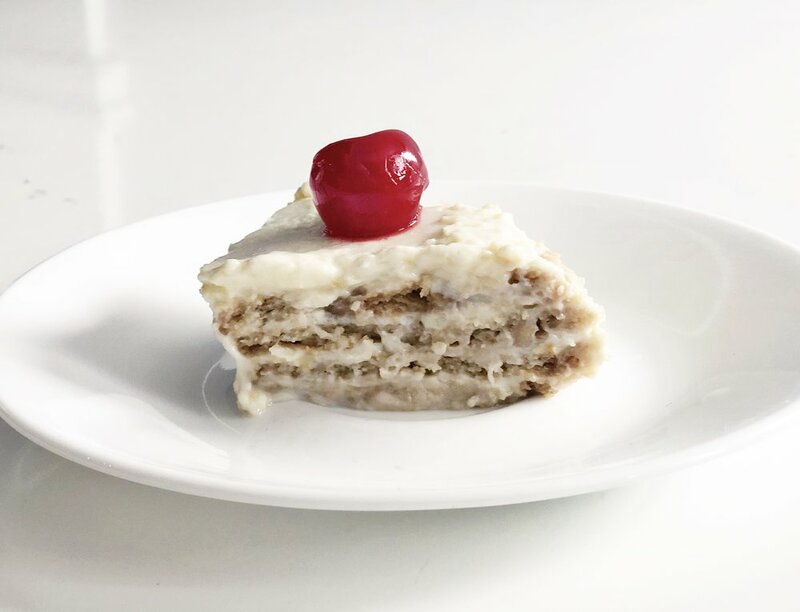 I sometimes add a cherry on top to make it more festive and because the Maraschino cherries actually give the dessert a nice balance. It’s a great option for Dia de los Reyes celebrations. I personally make it a point to teach my kids about the Three Wise Men. I have a nativity scene that I display every year and my sons always help me put it together. When it’s time to place the Three Wise Men near Baby Jesus, I share the story about the gifts they arrived with, in Nazareth. (which is perfect for a Dia de los Reyes gathering), you will need only four ingredients. You can find Nestle Evaporated Milk in convenient and easy-to-use Tetra Pak at Walmart! Combine Carnation evaporated milk, Carnation condensed milk and the juice of three lemons in a mixing bowl. Blend until it reaches a thick, creamy consistency. In a serving bowl pour a layer of the mixture. Cover the layer with Maria cookies (break small pieces to fill in empty areas). Pour another layer of mixture over the cookie layer and repeat until you reach the top of the bowl. The last layer should be the mixture. Refrigerate overnight. Serve cold. (Optional: Garnish with cherries). The kids love this dessert! My favorite thing about it— it’s easy to make and very hassle-free! If you notice, two of the four ingredients required for this recipe are Nestle products. Also, keep in mind that although very popular in sweet dishes, Nestle Carnation milk can be used in savory dishes, too! Friends, I hope you enjoyed learning a little bit about my family’s holiday traditions! How are you celebrating the Holidays? Are there any special dishes/desserts you prepare during the most wonderful time of the year using Nestle Carnation milk products!? Do you have any particular family traditions you’re looking forward to? I’d love to know! Thanks for reading and best wishes for an amazing New Year! Xo, -Anabel M.
Thanks for reading and best wishes for an amazing New Year! Turkey dinner from Bristol Farms! A Delicious Turkey Prepared with Bristol Farms’ Own Brining Blend! According to a 2018 Thanksgiving Dinner Trend Report by Bristol Farms, 52% of people surveyed said Thanksgiving Dinner leftovers last between 1-4 days. Friends, I can attest to that. We celebrated a Friendsgiving Dinner this past weekend and all leftovers were gone by Wednesday! It was a special gathering at our home where we welcomed my in-laws, including my brother-in-law and his wife who live in Bakersfield. I knew we had to celebrate our family reunion with a traditional holiday menu so I turned to my favorite grocery store to do the shopping! If you’ve been following my blog, then you know I’m a huge fan of Bristol Farms— a SoCal grocery chain that offers a great selection of quality and organic foods. I shop at Bristol Farms Mulholland (Woodland Hills), which is close to home. I was excited about our Mary’s Organic Free Range 19 lb. turkey and discovered that Bristol Farms developed its own Brining Blend too! I’ve always used the Brine method to prepare a turkey. It usually requires purchasing a bunch of ingredients like specific herbs, special salt and hard-to-find spices, boiling all the ingredients and placing the whole turkey in the solution known as brine. Then you leave the turkey in the brine for 8-12 hours before the bird is ready for the oven. 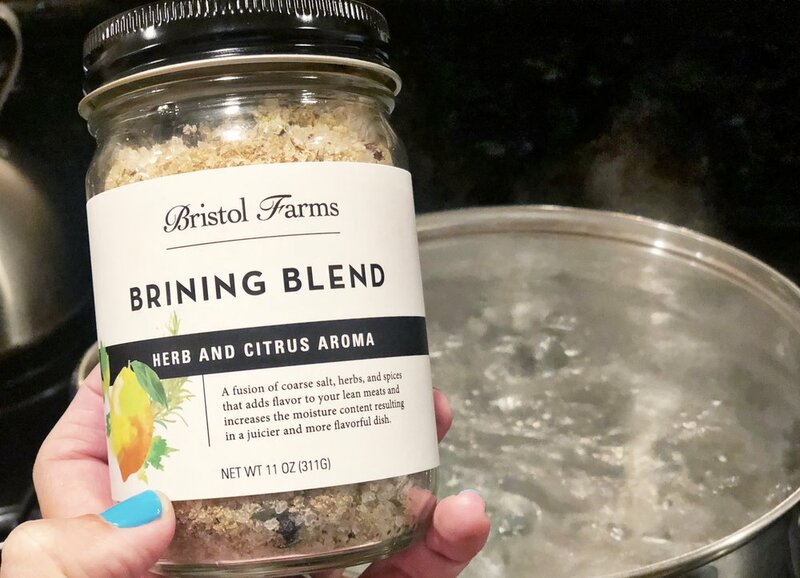 With Bristol Farms’ Brining blend, I saved a lot of time since all you have to do is add a cup of the brining blend with a gallon of water and boil. Once the mixture cools, you wash the turkey, place it inside a container, (we used a bucket) pour the brine over it making sure it’s fully covered and place it in the refrigerator letting it soak for up to 12 hours. The turkey turned out really juicy, full of flavor and our guests loved it. Plus, all leftovers are gone (which is probably the best indication of a tasty turkey, if I do say so myself). I had to be practical about the tablescape. Time was of the essence and I knew I would spend a lot of time preparing the food and have little time left to decorate the table so I purchased festive Thanksgiving-themed paper napkins, fresh flowers, a bundle of wheat stalks and even name cards for each place setting. Again, all items were purchased at Bristol Farms. In the store’s bakery section, I found small trays of Pumpkin Pie cupcakes (baked with organic ingredients). Instead of making pumpkin pie, why not offer each guest a yummy pumpkin pie dessert with cream cheese frosting!? yum! I decided to keep sides and appetizers simple. I bought a variety of cheese, crackers and spreads from Bristol Farms to offer guests ahead of dinner. Our dinner sides included roasted brussel sprouts, mashed potatoes, green beans and Pepperidge Farms cubed stuffing. My mother in law made a delicious sweet potato casserole and also brought cranberry sauce. By the way, did you know the item most forgotten at Thanksgiving Dinner is cranberries? That’s according to the same Bristol Farms 2018 Thanksgiving Dinner Trend Report I mentioned earlier. So yeah, thanks Grandma Dotty! with lots of laughs, great food and memories to last a lifetime. The entire meal for seven adults and two kids cost about $200. This doesn’t include beverages since my broski Mikey and his wife Rosita took care of the drinks. Bristol Farms offers a Cooked Holiday Box Dinner that serves 8. The dinner includes all the fixings– a Whole Roasted Turkey 8-10lb; Green Beans Almondine 2lb; Cornbread Stuffing 2lb; Mashed Potatoes 2lb; Candied Yams 2lb; Turkey Gravy 30 oz. All for $119. You can pre-order here. A glimpse of our Friendsgiving Dinner experience, which, despite the general stress that comes with getting everything ready, was sooo worth the time and effort. Did any of you host a Friendsgiving Dinner this year? I’d love to hear about your experiences and preferred recipes! Thanksgiving Day 2018 is a week away. I hope you all enjoy a wonderful time with your loved ones and save room for dessert! Being a proud daughter of Mexican immigrants and trying to do my best to raise boys who are culturally aware, I decided to make a unique snack on September 16 for Mexican Independence Day. In the early morning hours of September 16, 1810, a Catholic Priest named Miguel Hidalgo rang the bells of his church in the small town of Dolores in the state of Guanajuato and called the congregation to revolt against Spanish rule (BTW, I just got the chills typing this). That famous Cry of Dolores was basically a call to arms, triggering the Mexican War of Independence. The war itself lasted over a decade. Mexico’s independence wasn’t declared until September 28, 1821 but Hidalgo’s strong will and call to action to take back his country is what Mexicans celebrate on September 16. With that said, the boys asked nothing about Mexican Independence Day!! They wanted to know the meaning of the eagle located on the center of the Mexican flag. All you have to do is 1) dice the fruit 2) spread cream cheese on the graham crackers 3) use Walnut pieces to create an eagle look-alike in the center 4) Add tiny pieces of cilantro to look like the cactus where the eagle is standing 5) cover the left side of the graham cracker with the diced kiwi 6) Cover the right side of the graham cracker with diced strawberries 7) Enjoy! and why there’s an eagle at the center of the Mexican Flag. Many years ago in Mexico, the Aztec people needed to know exactly where to build their city. Their leader, a God named Huitzilopochtli (pronounced Weet-zee-low-poach-lee), told his people to search the land and when they came across an eagle standing on a cactus, eating a serpent— that would be their sign to make that place their home. When the Aztecs arrived in Mexico City, they saw an eagle, standing on a cactus and eating a snake. So they made Mexico City their new home! After our history lesson, we got to eat the crunchy snacks! Tip: In order to avoid the fruit and cream cheese from making the graham crackers soggy, eat immediately after preparing! Sutter Home & Spicy Salmon, a perfect dinner combination! Some days after a long work day that’s followed by a heavy traffic commute, I just want to get home, sit in my backyard, enjoy a glass of wine and watch my little boys play hide and seek. Ideally, my husband would be preparing a lovely dinner for us which would pair nicely with a second glass of wine to be enjoyed before evening mommy duties involving baths, story time and lullabies, take over. I’m able to daydream about this relaxing scenario because it happened recently and it was amazing! On a recent Friday evening, I was flustered with the amount of traffic on the I-5 Freeway coming home from Downtown Los Angeles. My work day had been long and stressful with a project deadline that seemed impossible to meet. Nevertheless, I got everything done and was ecstatic about going home. Upon arriving, I noticed my husband was preparing dinner. I had purchased all the ingredients to make a delicious Spicy Jalapeno Garlic Salmon recipe over the weekend but my dear hubby decided to surprise me with this dish after my long day at work. Then I realized I had a bottle of Sutter Home White Zinfandel! I was happy because Sutter Home is one of my favorite, California-based, family-owned wine brands (which also happens to be very reasonably priced). The Sutter Home White Zinfandel varietal was perfect for making this occasion a little more special! Plus, did you know Sutter Home sweet wines pair perfectly with spicy foods? This is important for me because as a Mexican-American woman who grew up enjoying spicy foods, I always look for drinks that pair well with my love of Latin, spicy cuisine. 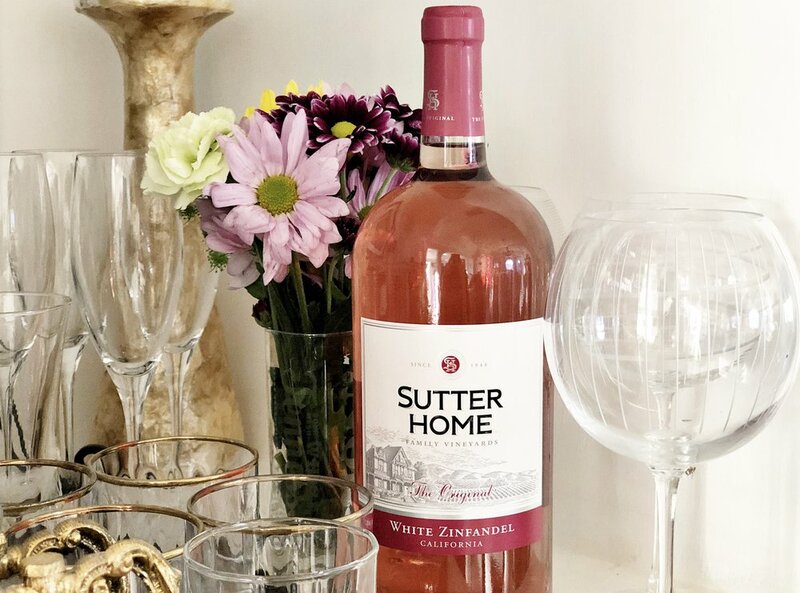 Sutter Home White Zinfandel is made with delicate aromas that lead to sweet, creamy strawberry and melon flavors and a crisp finish. If you pair it with the Spicy Jalapeno Garlic Salmon dish, you’re in for an exquisite, easy-to-make meal that’s light and enjoyable. Preheat your oven at 350 degrees. Dice the jalapenos, garlic and chives. I diced them finely to make it look more like a chunky sauce. Mix the diced ingredients into a bowl with the soy sauce and let it sit for about 10 minutes. Marinate the Salmon in the mixture with a spoon (you can also do it with your hands but beware– the spiciness of the mixture is real!! Once the salmon is covered in the mixture, set it on a skillet or oven tray. Bake the salmon for half an hour. It may require less time, depending on the thickness of the salmon filet. This particular recipe would also pair wonderfully with Sutter Home Moscato! After our backyard dinner, everything felt calm and relaxing. While my husband and I enjoyed our Spicy Garlic Salmon, my sons ate fish sticks, strawberries and apple juice…hehe. These memories are what make family time so special! And speaking of family, did you know Sutter Home Family Vineyards has received over 400 medals? I would be happy to award them with an extra ten medals for helping transform my long stressful workday into an enjoyable evening with my family. Friends, have you enjoyed Sutter Home wine? What recipes have you paired your favorite Sutter Home Wine with? They have a number of wine varietals for all of your enjoyment and entertainment purposes! Make sure you visit the Sutter Home website to learn more about the varietals and see more recipe inspiration! Somebunny's gonna scream for Ice Cream! If there’s one Bunny dessert that will go hand in hand with the hot weather expected in LA this Easter weekend, I would have to say it’s going to be Bunny Ice cream! 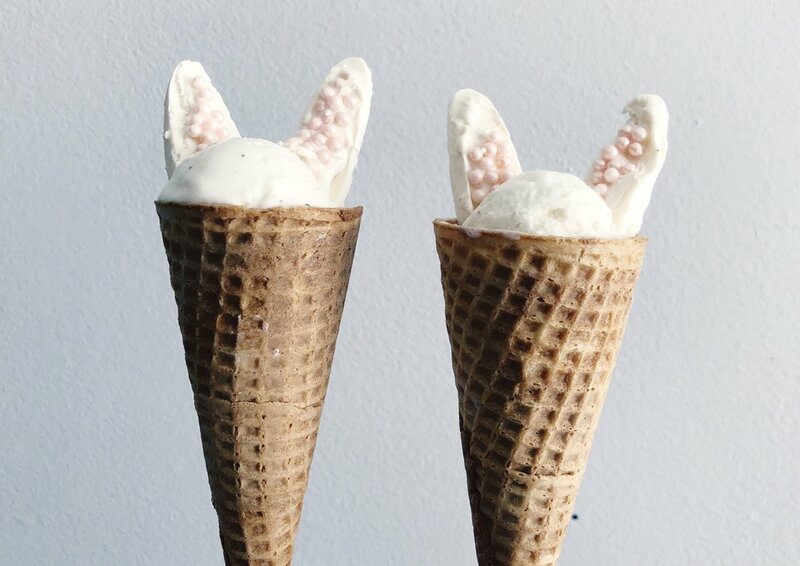 And no, I’m not referring to the actual Bunny brand ice cream (there is such a brand) I’m talking about a super cute, fast and yummy way to serve a cold scoop of frozen deliciousness and make it Bunny-themed, given the festive Spring occasion. The kids will love it because they get excited anytime there’s ice cream and they love when mom makes fun and themed snacks for them. Adults will think you’re a genius with too much time in your hands when this really only requires about 10 minutes of prep time. 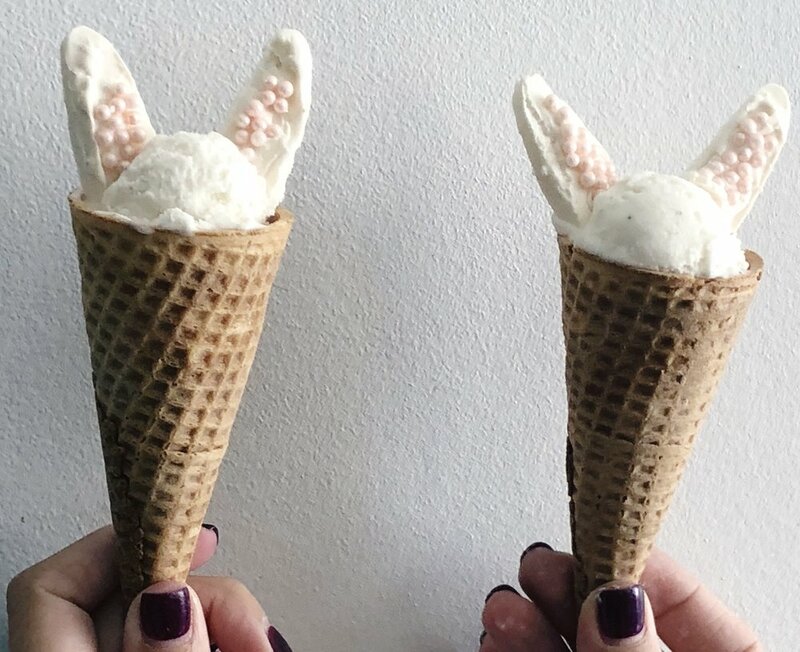 They’re Bunny shaped ice cream cones that require nothing other than homemade, candy bunny ears. The trick is in the bunny ears. I like the bunny ear tips to look pointy rather than round, so I used the end of a spaceship cookie cutter mold to give them a pointy shape. 1. Place the white candy melts in a microwave safe bowl and microwave them for a few minutes— just enough to make them melt but not all the way to the point they bubble. 2. Place scoops of the candy melt on parchment paper and let them cool. You can put them in the fridge to make this process faster. Once they’re set, mold them to give them a Bunny ear shape. Make sure they’re all approximately the same size. I used the tip of a space ship cookie cutter mold to make things easier. 4. Once you have the bunny ear shapes, carefully place the sprinkles along the center (use leftover candy melt to serve as glue). 5. Serve a round scoop of vanilla ice cream inside a waffle cone. I used a small scoop of ice cream which is nice to limit the amount of sugar intake!! But also it gives the illusion that Bunny is inside the rabbit hole and you can only see the top of its head. I hope you have a fun weekend! Temperatures in LA are expected to reach the high 70's.... perfect for an Easter-Themed ice cream treat. Happy Easter friends and thanks for reading! Paperless Post & Honey Toast! This is a sponsored post. I received a Paperless Post Credit in exchange for a review. All opinions are my own. I've always been one to encourage hand-written notes over emailed messages. I actually enjoy making an occasional trip to the US Post office to buy stamps and mail cards. But on occasion, a product will come up that completely sweeps me off my feet, making me rethink my modus operandi. And that's what happened when I discovered Paperless Post, an e-commerce company that focuses on design-driven online AND printed stationery, including greetings, invitations, birth announcements and wedding suites that you can customize, e-mail or print if that's what you prefer. The user-friendly service guides you through every step of the process, whether it's sending a design to print, uploading your logo for a company event or keeping track of your RSVP list online, Paperless Post has you covered. It's simple and there are tons of designs to choose from, in several categories. Since I'm planning a few events this year (Toby's baptism, birthdays, a Christmas Party, etc.) and life seems to be getting busier, I figured I would give Paperless Post a try and rid myself of extra work. The first Paperless Post greeting I sent was for my husband and I will share the story behind it. Paul was having a bad week. I was having a busy week. Our communication was off and we barely had the energy to keep our evening routine with the boys. To make matters worse, Paul was asked to work an extra shift on his day off! He could have declined, but he owed his co-worker a favor. Meanwhile, as I was getting ready to head home, I stumbled upon a painting of a bear-shaped honey bottle on a sidewalk in Downtown LA. I got home and once the kids were asleep and Paul was preparing for his extra work day, I decided to login to my Paperless Post account and look for an e-card to send him before he took off the next morning. Looking through the designs (there are many, including some by well-known designers like Kate Spade), I paused for a moment and walked to the kitchen, where I found Paul squeezing some honey out of a bear-shaped bottle into a fruit bowl. This was really funny considering I had just seen and photographed a honey bear bottle painting on the ground in Downtown LA. I shared the photo but he didn't seem to think much of it. Then I returned to my computer and low and behold–– there was a Paperless Post greeting card with the a bear-shaped honey bottle design! Call me crazy but I saw this a sign! The honey bear bottle gods were trying to tell me it was time to make Paul feel better about his bad week with a sweet honey message. I customized the card by adding my name since the message was on point. Then I simply added his email address in the recipient line and hit send. By the time we woke up in the morning, before heading to work, he read his Paperless Post e-card. Then, to make things extra special, I fixed him a hot coffee mug and a few slices of honey toast to send him off right. He seemed happy and grateful about the e-card gesture and even more so when he found the breakfast snack I had prepared for him– Honey toast! 3. Depending on the type of card you want to send, the service charges a few coins. While the honey bear greeting card was free, when I'm ready to send invitations for Toby's baptism, I will purchase coins. You can buy coin packages in a few easy steps and the pricing is really reasonable! Twenty coins for example, will cost you $6. Every time you customize or issue a card, the system will charge you the number of coins for that particular project. 4. Send your cards and make others smile! I hope you consider Paperless Post for your next, well, anything! It's fun, easy and hassle-free. Thanks for reading and have a great day, honey bears! For the Apples of my Eyes! My weekend breakfast routine with the kids almost always involves pancakes, often times in different shapes and colors and with different designs, to keep things fun. Benny and Toby love eating them, I love making them... but after a while, pancakes need a break too! The kids love syrup on their pancakes and though delicious, I know there are many other awesome and healthier breakfast alternatives. That's why I decided to get a little creative over the weekend and make fruit yogurt bowls out of Granny Smith Apples. So I went with a smaller fruit– Apples. Start out by locating a few nice, round and large Granny Smith Apples. Slice the top part of the apples, removing the stems. Carve out the mid section of the apples with a knife and spoon until you create a good size cavity. Make sure you don't carve too deep in order to avoid puncturing holes that can make the contents leak later. Fill with your kids' favorite yogurt and top with small fresh fruit bits & other goodies. I used cuties, peach slices, bananas, strawberries, almonds and Cheerios. Other ideas to use as toppers include: granola, kiwi, blueberries, chocolate shavings, diced melon and even gummy snacks! The best part is watching them finish the yogurt and take a bite out of their apple bowl. When was the camera when I needed it!? I hope you consider this easy and yummy breakfast option. Your kids will seriously thank you. Mine did! Message Heart Valentine's Day Pancakes! 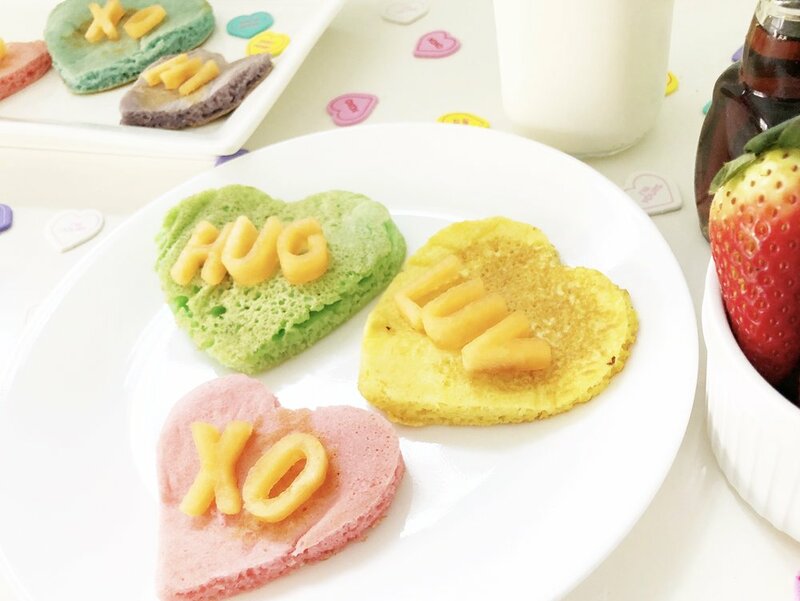 Here's a little breakfast idea we tried over the weekend in anticipation of Valentine's Day: Message Heart Pancakes! They are so, so very easy to prepare and make for yummy, colorful Valentine's Day themed cuteness. 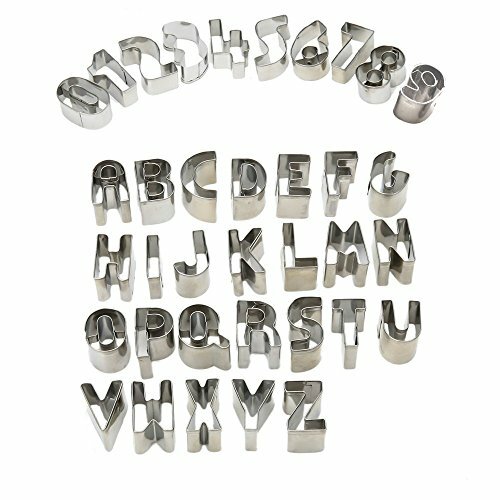 Here are the three (3) tools you need to make these at home: 1. heart-shaped cookie cutters 2. alphabet cutter molds 3. food dye. It all starts with pancake mix. I used a regular Aunt Jemima Box that only requires water. Once I had my batter, I divided it evenly in five small bowls. 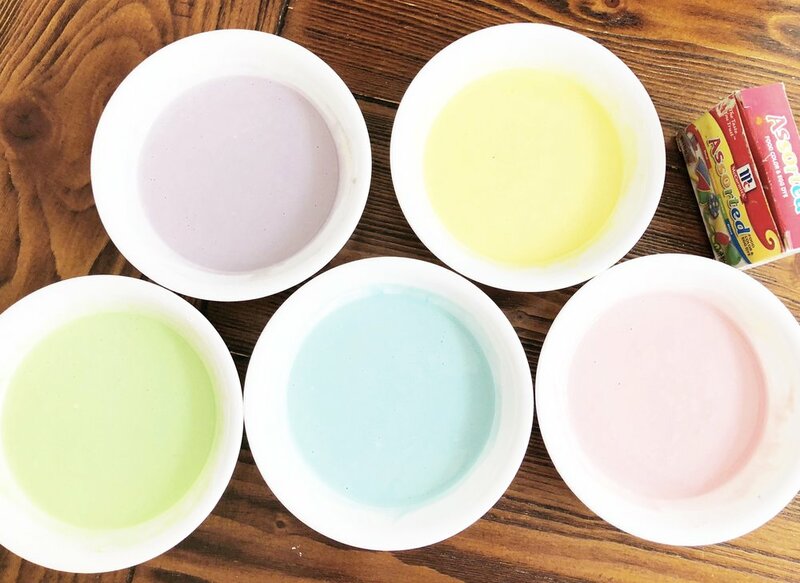 I squeezed a couple drops of food dye into each bowl, mixed each one thoroughly and turned each one into a different color. Meanwhile, I sliced a Melon into slices about half inch thick in order to make it possible to press down with the letter molds. I poured the pancake batter on a small round-shaped pan and tried to make sure they didn't stay on either side too long, in order to preserve the color! Once the pancakes were done, I used the heart cutouts to shape them. Then I cut fun words like "XOXO" and "LUV" out of the melon and placed them over the heart-shaped pancakes. Breakfast was ready and the boys consumed it all before I had a chance to get more photos!